Most ice cream/sorbet recipes will tell you that you can’t add too much alcohol because it won’t freeze. This is how to get around that. The Salty Dog cocktail is a Greyhound cocktail (4 parts grapefruit juice : 1 part gin/vodka) with salt on the rim of the glass. I love a good G&T and got to go foraging with The Botanist Gin. (You can read about it here.) I think it’s the balance of bitter/sweet that gets me, and it reminds me of grapefruit. Side note: I could drink litres of grapefruit juice every day. I love the stuff. 1 cup of Gin. Technically, you can use Vodka as well, but who cares about that? For most sorbets the best ratio of juice/pulp to sugar is around 4:1. 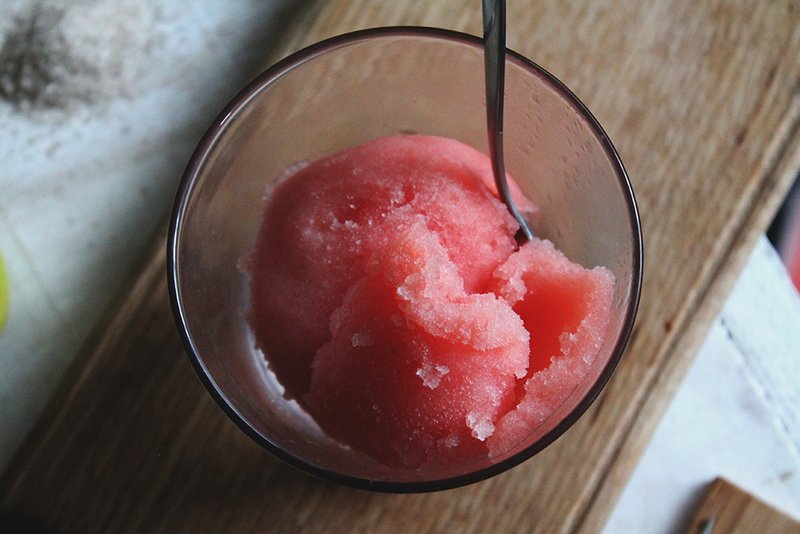 I found a teaspoon of glucose per cup of juice/pulp gave the sorbet some extra creaminess. The biggest problem with making this getting the alcohol to freeze, and unless you have access to some liquid nitrogen, it’s probably not going to work. The solution is to incorporate the alcohol without it mixing with the other liquid, which is why we use the agar to make a gel. It looks so innocent nestled in it’s glass, but don’t let it fool you. If this was a person, it would be a curvy pin up girl from the 50’s that can colonoscopize a mugger with one hand, while applying lipstick in the mirror. Mix the sugar, glucose, grapefruit juice, and 4 tablespoons of gin. Add half of the gin you have left to a pan, with the agar. Heat it up while stirring, until the agar has melted. Take off the heat and add the rest of the gin, and stir in so that everything is mixed. To test if the agar has dissolved in properly, drip a drop onto an ice cube, and touch it with your finger. It should as a single piece of soft gel. You don’t want a firm gel. If it’s too firm, you will notice it when you eat the sorbet. If it’s too firm, try adding more gin. Take your gin gel off the heat, and cool asap, by putting it into another container and placing it in the fridge. Once it’s firmed up, you can blend it with a hand blender till it’s a smooth gel. Add your gel to the rest of the liquid, and pour it into your ice cream maker. It will probably only get to a “slush puppy” consistency. I know it’s super tempting, but don’t drink there and then. Put it in a container and pop in the freezer over night. Once it’s firmed up, scoop it, sprinkle on some smoked salt (it goes “next level” good!). And that’s your Salty Dog Sorbet. Note: The gin becomes deceptively camouflaged, so be careful. Enjoy! Click here for or an amazing Honey Liqueur Ice Cream recipe.